Fig. 1. Transgenic plums in the greenhouse. A project to apply the Fastrack Program to the California Dried Plums was optimistically undertaken, based on the preliminary work and the long-term expertise and experience of the research team. Members have unique and extensive experience in plum breeding and transgenic technology of plum. In the breeding program at the USDA-ARS Appalachian Fruit Research Station, Kearneysville, WV, we have shown that plums engineered with the 'early & continual flowering' (ECF) gene have produced ripe fruits with fertile seeds within one year versus the required 3-7 years in conventional breeding programs, and have transmitted this trait to plum seedlings in preliminary greenhouse studies (Fig. 1. EFC plums in the greenhouse). Dr. Ralph Scorza, USDA-ARS Appalachian Fruit Research Station, Kearneysville, WV, geneticist and stone fruit breeder, developer of the plum pox virus resistant transgenic plum variety ‘HoneySweet’, has been undertaking the FasTrack hybridization and selection program to combine the desired traits in the early flowering lines. Dr. Chinnathambi Srinivasan, USDA-ARS Appalachian Fruit Research Station, tissue culture specialist and developer of the first ECF plums is developing additional ECF plum lines. Professor Ted DeJong, Plant Scientist, is director of the major dried plum breeding program at the University of California, Davis. This program has developed a wide assortment of high quality genetic resources (germplasm) for dried plum production, using conventional breeding techniques, and maintains a repository of this material. 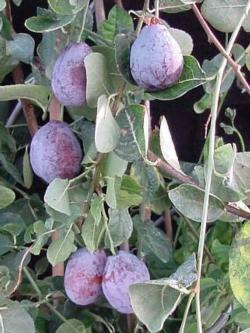 This program has also conducted genetic studies of plum (DeBuse et al., 2005). Dr. Albert Abbott, Clemson University, has been responsible for the accumulation of Prunus-wide molecular markers that will be needed in this project to determine parental contributions. By combining the resources of the USDA-ARS Appalachian Fruit Research Station, UC Davis, Clemson and Penn State programs, we are poised to rapidly develop improved germplasm that addresses the needs of the California Dried Plum Industry.